Apple has launched a contest once again to celebrate the success of the App Store, and this time it’s the lead up to 25 billion app downloads. The winner of the 25 billionth download will receive a $10,000 gift card towards the App Store. Anyone who downloads an app will be automatically entered to win. As of today, nearly 25 billion apps have been downloaded worldwide. Which is almost as amazing as the apps themselves. So we want to say thanks. 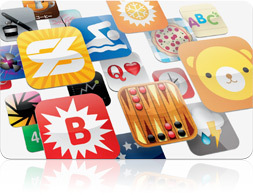 Download the 25 billionth app, and you could win a US$10,000 App Store Gift Card. * Just visit the App Store and download your best app yet. You can also enter without downloading an app though. Just call 1-866-296-5926 or fill out this online entry form. There is a limit of 25 entries per person per day regardless of method. Canadians are eligible for the contest, and there is no fine print excluding Quebec as in the past. Back in April 2009, Apple held a similar contest to celebrate 1 billion App Store downloads, and again last January to mark 10 billion downloads. It’s amazing how far the App Store has come. Good luck everyone!